Is it possible to save the environment and improve operating profit at the same time? Yes it is. And Nokia is doing it, and facilitating it for customers in many ways - one of which is through an industrialized process known as remanufacturing. Three positive things occur when a remanufactured product is delivered: 1) beneficial impact to the environment in terms of greenhouse gas emissions, 2) improved business financials, and 3) customer satisfaction as price and delivery lead time improve. Remanufaturing enables circular supply. Industry has been nudging and nurturing governments to align the world economy towards circularity, as the current flood of information on this topic testifies. A circular economy is a must, not a choice in our future. Nokia believes we cannot continue to be a “take, make and waste society”; a linear supply approach is not sustainable long term. Built on the concept of reuse, circular supply is referred to as closed loop, whereby used products come back to the original manufacturer and components and materials are used again to produce new products of the same type. 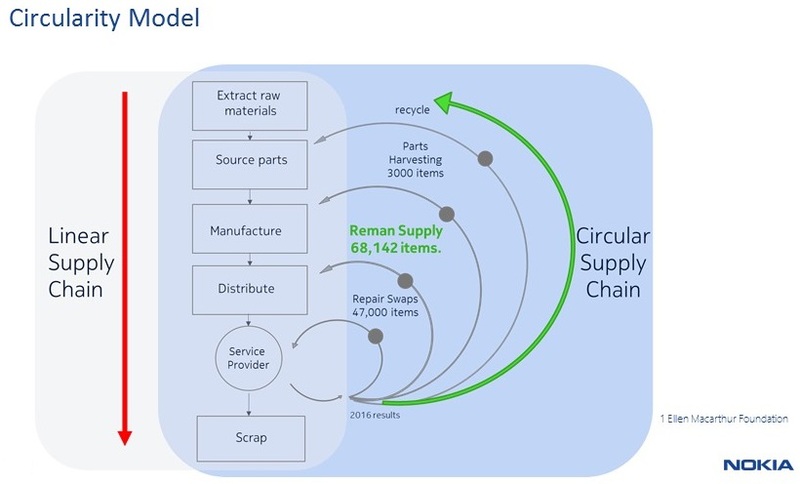 The diagram below, slightly modified from the Ellen Macarthur Foundation, depicts what Nokia operations is doing in terms of circular supply. Most companies determine that the cost advantage value of used products is in the repair loop, but not all companies have institutionalized remanufacturing into their supply chain as Nokia has done. Telecommunication networks evolve continuously. Next generation products disrupt old technology and thus legacy products are born. Eventually, all legacy products get displaced but rarely all at once. It’s an evolution that is implemented over time through network modernization projects. This creates technology overlap, which happens when one operator upgrades their network displacing the exact legacy product that another operator is still buying. Technology overlap thus creates opportunity for circular product flow and remanufacturing. In the above diagram, when Nokia starts manufacturing the P2 product, it will disrupt P1 and create a technology overlap. P1 will be displaced in high volume but continue to have strong demand. Thanks to a closed loop supply chain, displaced P1’s can be repurposed as circular products and the manufacture of new can be reduced. 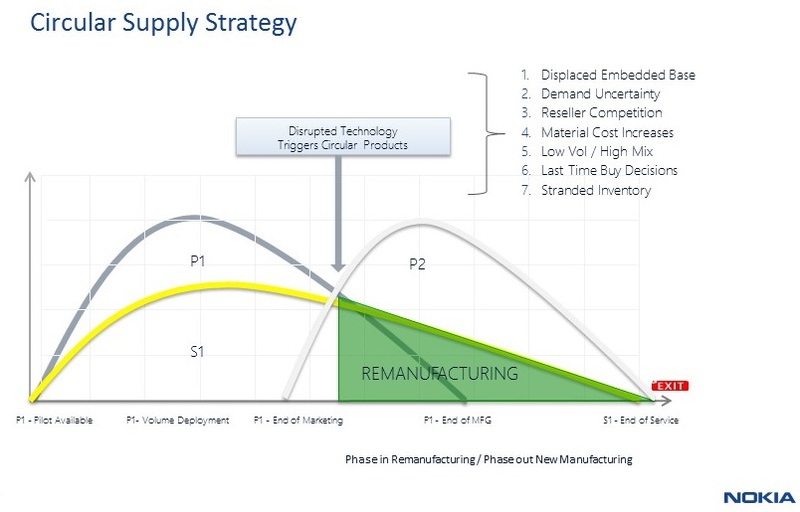 This will lead to significant per unit cost reduction along with an opportuntity to drive higher margins, reduce spend and inventory, and prevent P1 from reaching the secondary market (grey) market. As for the impact to our environment, each unit saves 969kg of CO2e. If circular products are used to support just 15% of the projected annual demand, the greenhouse gas emission avoidance is 43,605MT. That’s is enough energy to heat 4,605 homes. So, yes!It is possible to save the environment and improve operating profit. In February 2017, an industry standard was created by the Remanufacturing Industry Council (RIC) and published through ANSI. The specific standard is RIC001.1-2016: Specification for the Process of Remanufacturing. At Nokia, remanufacturing is industrialized. Products are differentiated from new by a unique part number which is used to differentiate cost, inventory and orderability. When the customer receives a remanufactured product and opens the box, the items will have the exact same form, fit and function as new. All remanufactured products are upgraded to the latest factory shippable version and are compliant with the most recent software generic. They are assigned the same warranty as new and qualify for all the same services such as repair, advanced exchange, and technical support. The industrialization of remanufacturing is a Nokia corporate social responsibility (CSR). In a world of finite resources, a “take, make, and waste” approach is not sustainable. At Nokia, wecontinue to leverage the benefits of a circular business model to have a favorable impact on our own bottom line. What’s not to love. Don is a Senior Director at Nokia responsible for the corporate portfolio of Remanufactured products. As head of Special Customer Operations (SCO), he’s proud to point out the little known fact that Nokia is a world leader in remanufacturing with over a hundred product families and thousands of orderable items sold worldwide.